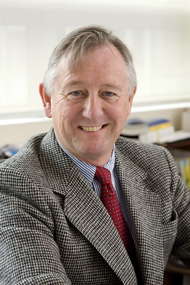 Professor Milner is a member of Laboratory for Nuclear Science's Hadronic Physics Group. His research is focused on studying the spin structure of strongly interacting systems. A major focus of his research effort over the last decade has been the HERMES experiment to study the spin structure of the nucleon. This work was carried out in collaboration with Prof. Robert P. Redwine. HERMES has provided important new data on the flavor decomposition of the quark spin and on the contribution of the glue, yielding a number of new, unexpected results. One of Prof. Milner's most recent efforts was at the MIT Bates Linear Accelerator Center, where the construction of a new large detector called the "Bates Large Acceptance Spectrometer Toroid" (BLAST) was completed. This work was carried out in collaboration with Profs. Bill Bertozzi, Haiyan Gao, June Matthews, and Bob Redwine. BLAST is used with the stored polarized beam to measure spin-dependent electron scattering from polarized hydrogen, deuterium and He-3 targets. BLAST provides important information on the spin structure of light nuclei as well as on the neutron form-factors. Professor Richard Milner joined the MIT faculty in 1988, where he served as Director of the Bates Linear Accelerator Center, and Director of MIT's Laboratory for Nuclear Science. He received his B.Sc. in 1978 and his M.Sc. in 1979 in Physics from the University College, Cork, Ireland, and his Ph.D., also in Physics, in 1984 from the California Institute of Technology, where he was was a Research Fellow from 1985 to 1988. Ackerstaff, K. et al. (THE HERMES Collaboration), Flavor Decomposition of the Polarized Quark Distributions in the Nucleon from Inclusive and Semi-Inclusive Deep-inelastic Scattering. Phys. Lett. B464, 123 (1999). Ackerstaff, K. et al. (THE HERMES Collaboration), Observation of a Coherence Length Effect in Exclusive Rho^0 Electroproduction. Phys. Rev. Lett. 82, 3025 (1999). Ackerstaff, K. et al. (THE HERMES Collaboration), Beam Induced Nuclear Depolarisation in a Gaseous Polarised Hydrogen Target. Phys. Rev. Lett. 82, 1164 (1999).